There are number of Banff Lake Louise travel options for you to choose to get around Banff National Park. Before you choose the Banff and Lake Louise Travel options, you might want to know about Banff National Park, such as how big the area to travel, what the road conditions is like, what you can see and do, etc. If you drive, this is by far the best Banff travel option for getting around the Park. There are plenty of hiking trailheads which can be difficult to access without a vehicle. Public transportation is very limit to those trailheads. Besides, you also can enjoy the spectacular scenery and spot wildlife on your own schedule. Here is an example, which give you idea about taxi. Taxis range from about $27.00 traveling between Banff and Canmore (22 km), about $80.00 traveling between Banff and Lake Louise (52 km). There is over 20,000 square kilometers to explore in the Canadian Rockies including surrounding parks. If you want to get most of it, how much will cost you by Taxi?! Car rental rates start around $55.00/day for a compact car. Of course, the better Banff Lake Louise travel option is to drive yourself instead of take a taxi. Click here for detailed self driving tour. Car rentals are available in Calgary, Banff and Lake Louise. There are number of shuttle buses have daily services. Greyhound and Brewster have daily services between Banff and Lake Louise. 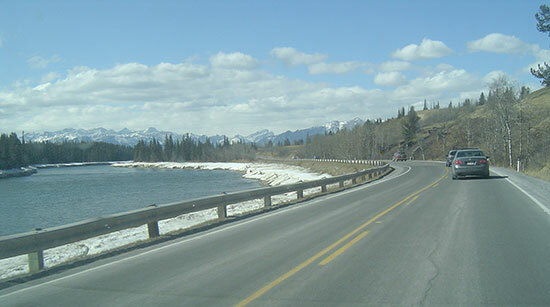 Sundog Mountain Connector has daily service Banff–Lake Louise-Jasper. Reservation is required. Please click here for details of the three shuttle services. In winter, Ski Resort Shuttles pick up from most hotels in Banff and run throughout the day. Some hotels offer a complimentary shuttle service for guests and during the ski season there is a shuttle running between many hotels and the three ski areas (Sunshine Village, Mt. Norquay and Lake Louise Resort). If you are taking ski vacation here, you might not want to rent a car for whole vacation time. The shuttle bus is a good option to bring you to/from skiing resort. You might just need to rent a car in Banff or Lake Louise for one or two days while you are off skiing. 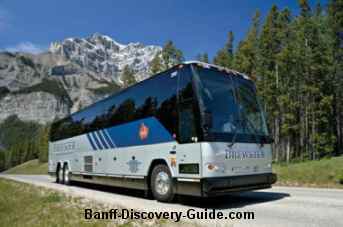 There is Banff Transit service only in the town of Banff. The transit buses service daily between the Fairmont Banff Springs Hotel, town centre, Tunnel Mountain hotels (to the campground in summer) and along Banff Avenue. The transit rate is $1.00 for adults and $ .50 for children. During the summer (May 1 to September 30), it is difficult to find parking spot in the center of Banff. So it is a good idea for you leaving your vehicle at the RV parking at the north end of Banff Avenue and catching the bus into town. If you do not drive yourself, the taxi is a good option for short distance. For example you want take a taxi from your hotel to specific trail head which no shuttle bus or public transit to access. A number of taxi companies service the Banff area 24 hours a day. Taxis may be found at numerous taxi stands along main avenues or hailed on the street in downtown Banff. When you call a cab, the usual wait time is 5 - 10 minutes. This does not apply at 3:00 AM in the morning after the bars close. During this time you are better to try to find an empty taxi near one of the bar entrances. Taximeters start at $2.55 and increase by $ .15 with every 30 seconds. If you do not drive, or no time to pre-arrange your trip, the best Banff Lake Louise Travel option to explore the Canadian Rockies is taking sightseeing or other activities tours. There are number of tour companies such as Sundog Tours, Brewster, Explore Rockies, and Discover Banff Tours etc. offer various tour packages you can choose. The sightseeing tours take you to the most exceptional locations for photos, wildlife viewing, and nature walks! Biking around the Town of Banff is the most fun and effective way. In the summer, while other people spend time to wait in long traffic bottlenecks and look for park spots, you'll be getting to where ever you want to go. There are many bike trails close to Banff. Biking is the perfect way to slow down (or speed up), you have better chance to enjoy beautiful mountain scenery. You can easily to stop any time for taking pictures or watching the wildlife. It is not that easy to do this when you are driving. There are lots bike trails crossing over the park and surroundings. If you want to bike across the whole park, it is possible, but keep in mind the mountainous terrain will make this quite a workout. The best Banff Lake Louise travel way on bike is that you either rent a bike (come with bike map, helmet and lock) and choose the bike trails you like to explore by yourself, or join bike tours. The Ski Stop Shop offers various bike tours from Guided Soft Adventure tour to Self-Guided Hard Adventure tour. There are many bike rental shops in Banff and Lake Louise. Town Bikes, Hard Tail Mountain Bikes, Full Suspension Mountain, Touring and Hybrid Tour Bikes all available. It is easier and less workout to ride a moped than bike. You can rent a moped from Bactrax/Snowtips to explore the area around Banff National Park. Many activities and attractions in Banff are within easy walking distance (within 20 minutes) from the centre of town. If you are staying in the Town of Banff and not planning any trip outside of it, then you can walk, or take a short cab to further attractions outside downtown area. If you want to see rest of park, or see surrounding parks such as Jasper, you need a vehicle to get around. Now, You probably have an idea which Banff Lake Louise Travel option or combination is the best for YOU to get around the Park and surroundings.